The production of the original BA II PLUS - introduced 1991 - was shifted in the year 1995 to Malaysia and later to China. You'll notice small changes in the design of the calculator, e.g. position of the logos and size of the letters on the keys. 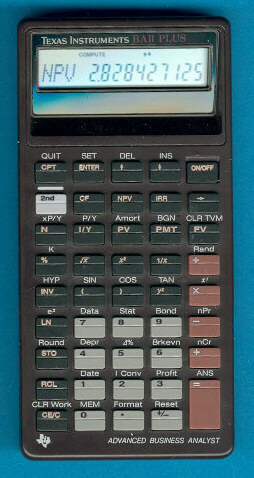 The financial sibbling of the BA II PLUS, the TI-68 got the same changes. In some European countries the calculator was sold as Texas Instruments BS II (Business Scientific 2). In 2000 the calculator got in some countries a more stylish housing, it seems that this calculator will last in France more than a decade. View the new edition here. Texas Instruments introduced in 2004 the improved successor called BA II PLUS Professional. Stokes Publishing Company, Inc. based in Sunnyvale, California sold a companion for the teacher, view the colorful Business.